Whether you are an antique buff looking for unique seating for a family room, a coin-op collector wanting to add the perfect touch to a game room or simply want to enjoy a comfortable chair from years gone by, an antique barber chair may be just the chair for you. 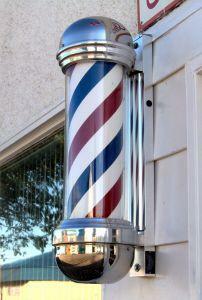 Since ancient times barbers have cared for the needs of people. Until the late 1700s, barbers not only cut hair and shaved faces, they also did surgical procedures on wounds, performed bloodletting and pulled teeth. In the 1900s the trends in barber chair styles and materials changed with the times. Slowly the beautiful ornately carved wood gave way to chairs made of porcelain covered cast iron. Perhaps one of the most well known models of Berninghaus barber chairs is the "Hercules # 58" hydraulic barber chair manufactured in 1899. It was one of these barber chairs that M.G.M. used in their famous 1960 film on time travel "Time Machine". Today most collectors searching for an antique barber chair to add to their treasures want a chair dating from 1880s to the 1950s.